Check this out! Aceing Autism’s Nils Weldy recently sat down with David Hoy at Primal Brewery to chat about ServeAces Mini Tennis, the newly painted permanent courts and what else? Beer! Read a snippet below and click on the link for the full article. 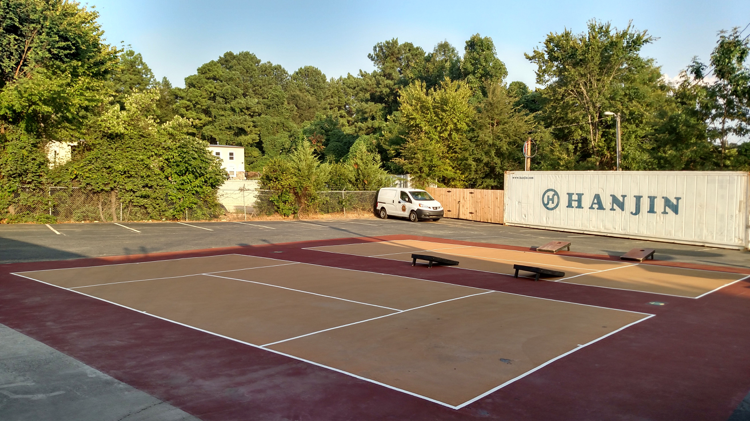 LNTA helped them to acquire a USTA Line Grant and had these courts painted for FREE! Unofficially, Primal is the first and only brewery to have permanent (mini) tennis courts on site. Were you struck by a John Isner ace prior to conceiving this idea or where did the motivation come from? The idea actually came from the Queen City Brewers Festival two years ago. A regular of ours, David Kopp, who is a huge tennis fan and player, had been encouraging us to look into this cool bar tennis league put on by the Lake Norman Tennis Association. Since we’re not big tennis people, we didn’t really give it the attention that we should have, so at last year’s Queen City Brewers Fest, David and I got on the mini tennis court, tasted some beers and had an awesome time. While it is competitive, it’s not just about the competition. There are a couple of neat caveats with the bar tennis league: no stacking teams and you have to have at least 80% non-tennis players on your team, which is great when you think about it, because it’s growing the game, driving interest and attracting new league participants.